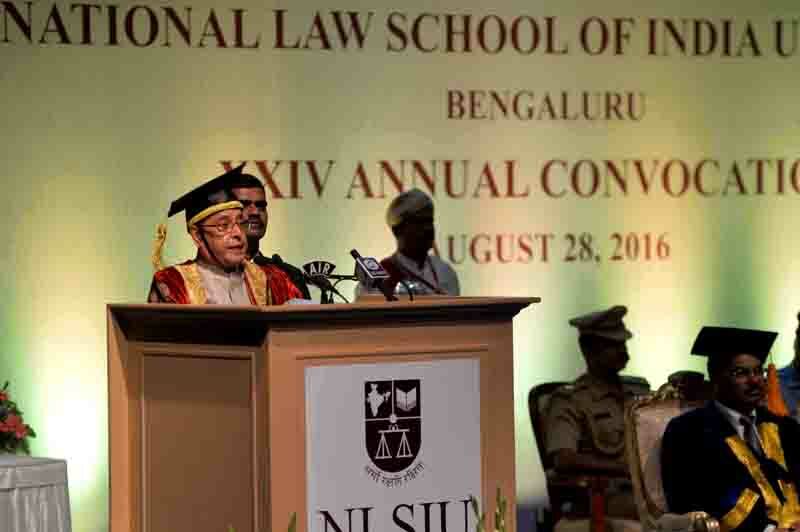 I am happy to be in Bangalore today to attend the Convocation of this prestigious law school. The National Law School of India University (NLSIU) came into existence in 1986 as a result of the combined efforts of the Judiciary, the Bar Council of India, the Karnataka Bar Council, the Bangalore University and the Government of Karnataka. The first Law School of its kind in the country, NLSIU was created to reform legal education and establish a centre of excellence for legal education and research in India. I am aware that NLSIU has consistently been No. 1 in most surveys conducted of Law Schools in India. Its students, alumni and faculty have already established for themselves an excellent reputation in the country and abroad for their knowledge, intellect, character and leaderships skills. I therefore convey my compliments to the management, faculty, alumni and students of this institution on this remarkable achievement. I also congratulate all the students graduating today for their success in this prestigious institution. Legal education has undergone a paradigm shift in the last two decades. NLSIU must bridge the gap between the theoretical concepts and practical application. It must ignite inquiry and spirit of asking questions on all issues. I am happy to know that NLSIU has had, from the start, a Legal Services Clinic and a Centre for Women and the Law reaching out with legal aid and advice to women, as well as others from the disadvantaged sections of the society, and with mediation and negotiation for settlement of disputes. Faculty and students of NLSIU also help in creating legal awareness mainly among women and girls through classes in colleges and schools in and around the city of Bangalore. Friends, India has one of the finest constitutions in the world. Its driving principle is a compact between state and citizen, a powerful public-private partnership nourished by justice, liberty and equality. The Constitution represented a second liberation, this time from the stranglehold of traditional inequality in gender, caste, community along with other fetters that had chained us for too long. I urge all of you students of law to study our Constitution well. Understand our political system, its institutions and processes as established by the Constitution and law. Analyse the choices that were made to build the country into what it is today. Recognize that intelligent choices will need to be made for enabling this country reach her maximum potential. Participate in making these choices and don’t just be a bystander. You are amongst the brightest young minds in this country. You must help policy makers make the right policies. You must be willing to read, learn and formulate views on national issues. A democracy cannot be healthy without informed participation. It is not enough to merely vote periodically. It requires effective implementations. Be the change that you seek through participation in all matters relating to governance and the state. Choose to engage with our beautiful, complex, often difficult and sometimes noisy democracy – help strengthen and refine our legal and political institutions. Pass on what you have learned here, and help others understand their rights as well as responsibilities. Help the nation create better citizens who are able to access all the opportunities that our country and society offer. Lawyers are given a special status in this country because society recognizes the special functions that they perform. Lawyers have a duty to fight injustice wherever it exists. Supreme Court of India has through public interest litigation provided a powerful instrument in the hands of the common people which strengthened our democracy. I express my deep gratitude to the Supreme Court of India. You have to be brave. If you are asked to pay a bribe, have the courage to refuse. If you are asked to support violence, corruption or oppression, have the courage to say no. If you fear reprisal, remember that breaking an unjust system is about making difficult choices. Mahatma Gandhi who was also a lawyer could not have forged the instrument of Satyagraha and led the people of India to Independence if he was not brave and willing to make the difficult choice of fighting against the colonial rulers in South Africa. The legal fraternity, especially students of law, must be in the vanguard of the battle for the rights and welfare of our people. Universities like NLSIU must take the lead in meeting contemporary challenges and ensuring that our civilizational values of love for motherland, performance of duty, compassion for all, tolerance, pluralism, respect for women, honesty in life, self-restraint in conduct, responsibility in action and discipline are fully entrenched in young minds. I would like to request the student community of NLSIU to keep in mind the fact that your education is a gift of the state and society. The land on which your university stands, these buildings, the books that fill your library, the online databases etc. are all the state’s investments in you. Graduates from this prestigious university must constantly look for ways in which you can give back to your country. This poem applies to young lawyers as much as judges. As you graduate, be like the loving gardener in the poem tending to the written law. Give of your warm blood and your heart. Be wise and selfless. I am confident all of you will fulfil the hopes and expectations of our nation by becoming professionals who are competent, technically sound and socially active. Always uphold the Constitution of India and contribute your utmost to our nation as it addresses the imperatives of the new millennium.